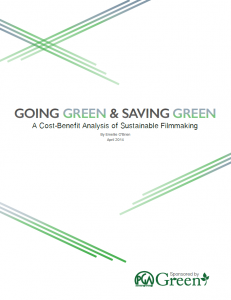 The myth that it costs more to “go green” on set is currently plaguing the production of film and television. Sustainable filmmaking efforts are making significant strides and continuing to evolve. When resistance by decision-makers occurs, however, it is often due to complaints over cost. The document below shows how pro-environmental measures can translate into budgetary savings for productions. With adequate preparation during pre-production, thorough communication across all departments, and an Eco Manager/Eco Supervisor to oversee initiatives and track progress, sustainable filmmaking is not only effective, but cost efficient. The bulk of this analysis surrounds New York specific vendors and pricing.